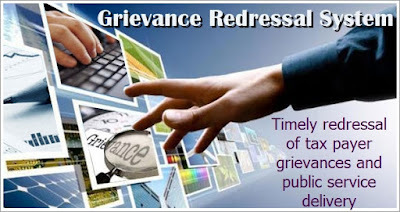 Grievance redressal is a major aspect of citizen centric governance and is an important feature of the activities of the Income Tax Department. The Central Action Plan 2015-16 of the Income Tax Department released during the Annual General Conference of senior officers held on 25-26 May 2015, has stressed on service delivery and timely grievance redressal as a key result areas for the Department. The Income-tax Department is addressing grievances through a multi-layered grievance redressal machinery including Centralised Public Grievance Redress and Monitoring System (CPGRAMS), Aayakar Seva Kendras (ASK), online grievance redressal through Central Processing Centre (CPC), etc. The status of redressal of grievances and initiatives at the end of first quarter of F.Y. 2015-16 was reviewed recently by the Government. The disposal of grievances received through CPGRAMS has improved considerably. From 1.4.2014 to 22.07.2015 the overall disposal rate of grievances received on public grievances portal of the Government of India works out to 85%. The Department has established 250 ASK Centres across the country to facilitate delivery of services identified in the Citizen’s Charter to the taxpayers. A road map is being readied for additionally establishing 58 ASK Centres during the current Financial Year. The department is committed to improve the delivery of service through ASK Centres. Towards this end, it has decided to mount proper training and refresher programmes for the officials working in ASK Centres with a certainty of tenure for such officials. The disposal of Rectification Applications was also reviewed where pendency of cases was considerably high. At the end of first quarter of the current Financial Year 65 percent of the rectification applications received in the Department were disposed off. The Department is working on improving systems to reduce the time taken in disposal of rectification applications. The Department is committed to the objective of timely delivery of quality taxpayer services and time bound disposal of grievances. This will be closely reviewed from time to time.